Welcome to the first day of Spring! We had lovely sunshine here and it got me thinking of Springs past. Which made me remember the cake I made for Easter one year. Since I didn't bake anything other than pizza today, I thought I would share that cake. It was probably a chocolate cake with chocolate fudge filling, but it may have been a carrot cake, I don't remember exactly. Either way, I covered it in yellow buttercream and did a basket-weave around the sides to simulate a woven basket. Then, using a #4 piping tip, I made grass from yellow buttercream. I fashioned a little chick from fondant and put him in an open plastic egg. I "filled" the rest of the basket with empty plastic eggs. I could have filled the eggs and used them as party favors and that would have been more fun, but it would look the same. I made the handle purely from fondant, but I really should have added gum paste to make it harden and hold up. 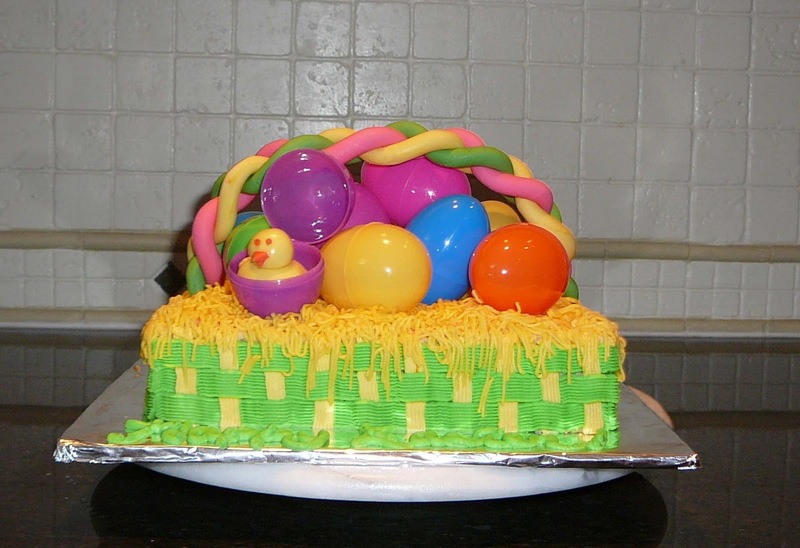 As a result, the handle drooped and fell onto the plastic eggs before I presented the cake. No big deal; it wasn't meant to be eaten anyway. I finished the cake with "Happy Easter" piped in green on the foil base. I haven't forgotten the promised birthday cake either. I'm thinking of scheduling the party for this weekend so you might see it by then! For now, Happy Spring!